We spent this past weekend at two events. On Saturday we were at Space City Vex helping out our friends the Robonauts FRC#118 with their VEX tournament. 11 of our members volunteered as refrees and field reset. Our head coach received the volunteer of the year award for being the Head Referee of the tournament. 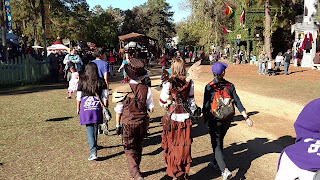 Sunday we did some team bonding at the Houston Renfest. Lots of STEAMworks related items at Renfest, including this store. We'll be off for Thanksgiving break, but we have our FLL qualifier on Dec 3rd and lots of preparation are underway for that.